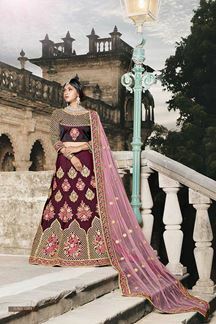 Spread your charm wearing this supreme wine colored designer lehenga Choli set featuring a plain velvet lehenga done at the top half in resham and stone accentuation followed by the bottom half done up in glitter motifs while the Choli looks stunning in same style for an enhanced glow! This Lehenga Choli set is accompanied by contrasting pink net Dupatta. Note: Color may slightly vary due to digital photography.